Have you ever wanted to set the clocks in all your controllers at the same time? There’s a quick and easy way to do that. 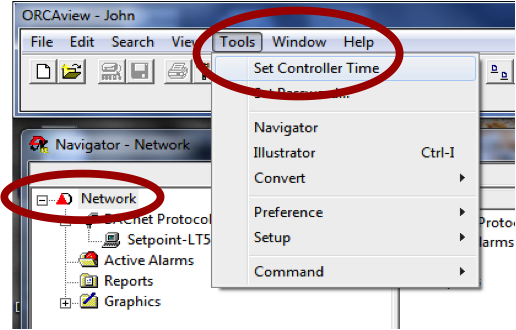 Simply click on the word “Network” in the top-left corner of a Navigator window. Then click on the “Tools” menu and select “Set Controller Time”. This entry was posted in ORCAview Tips and tagged Delta Controls, Orcaview, setall clocks, Setpoint Systems Corporation on October 4, 2013 by setpointsystems.